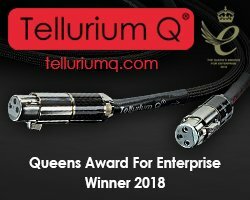 Audioplan is a long established hi-fi manufacturer from Germany founded in 1981, with a history of producing excellent sounding speakers and now ancillaries are also added to their portfolio, including cables and supports, plus the PowerStar power distribution block and the Finefilter conditioner/filter unit reviewed here. 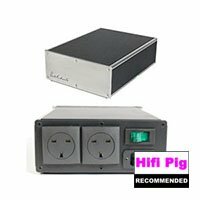 I am more than surprised that Audioplan don’t have a greater presence here in the UK, although I have seen the Kontrast loudspeaker advertised on several occasions throughout the years and tempted more than once to buy a pair. Perhaps we are being a touch too parochial with home grown products when there is a plethora of products waiting across the Channel that has real merits for adding to an audition shortlist. 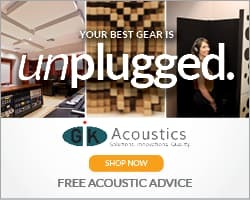 Arguably, we have the likes of Atoll, Advance Acoustic, Focal, Cabasse and Triangle from France that was instantly recalled from memory without any effort, but I truly struggled to recall any from Germany apart from Audio Physic. Shame on me and I bet I am not alone in this. I regard a mains conditioner as an essential rather than a luxury or a frivolity, so my system has one permanently installed and wouldn’t be without it. I pay particular attention with any of these devices under review, as to whether or not the conditioner or filter squashes or curtails dynamics, so that benchmark test is high on the agenda when I evaluate any filtering/conditioning device. Anyway, back to the matter at hand and let’s find out what the Audioplan PowerStar and Finefilter are about. The PowerStar mains distribution block is a huge change away from the often found “strip” type of power block arranged in a gang of four or more outlet sockets mounted in a straight line. Nothing actually wrong with that arrangement per se when implemented correctly, but it is not uncommon for the internal bus bars to be made from brass, which means there can be a slight voltage drop and/or loss of power between the socket nearest to the inlet and the furthest one away. The PowerStar “S” device is a flat drum shape measuring 12 x 8,5 x 22 cm (WxHxD) made from 5mm cast aluminium which looks like black machined Delrin material. 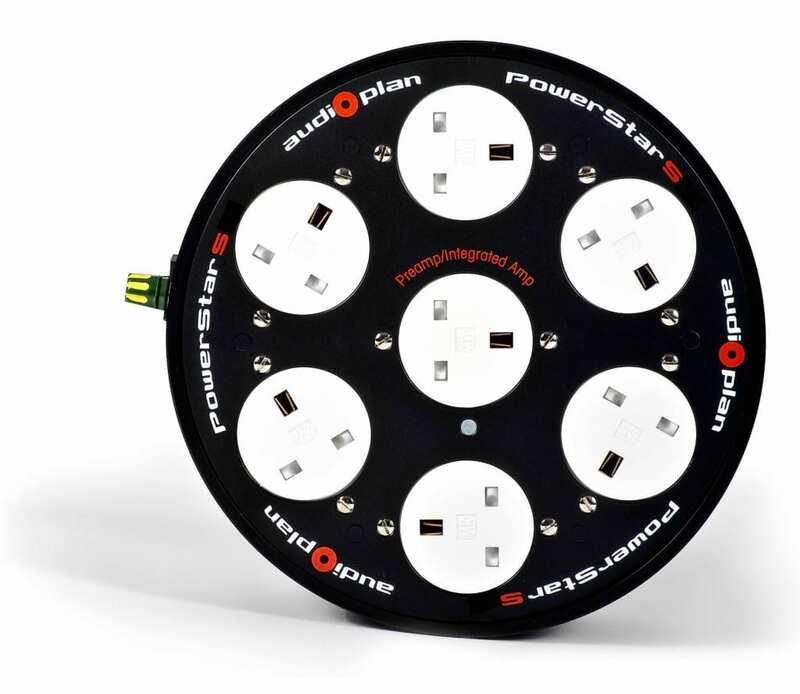 There are seven power outlets arranged in a radial pattern of six around the perimeter with the seventh outlet located in the centre. The review sample was fitted with seven 3 pin 13 amp UK sockets, but Schuko and other sockets are available to order I believe. Power inlet is by way of a C19 20 amp high power IEC socket. 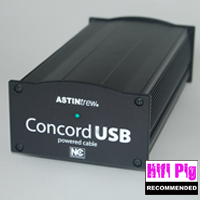 Power rating is 16 amps continuous with overvoltage protection. The unit is supported on 3 round feet which can be unscrewed if so desired and Audioplan have bored a keyhole type of aperture for wall mounting. It is wired internally in a “star” arrangement, the theory being that all sockets are equidistant from the inlet and hence no voltage or power losses between sockets can occur. The “S” suffix denotes this is the deluxe version with silver internal wiring. 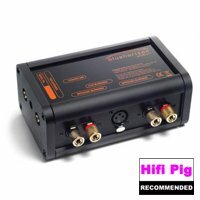 The FineFilter “S” submitted for review is a plain looking black painted box with a hard wired mains inlet cable attached. 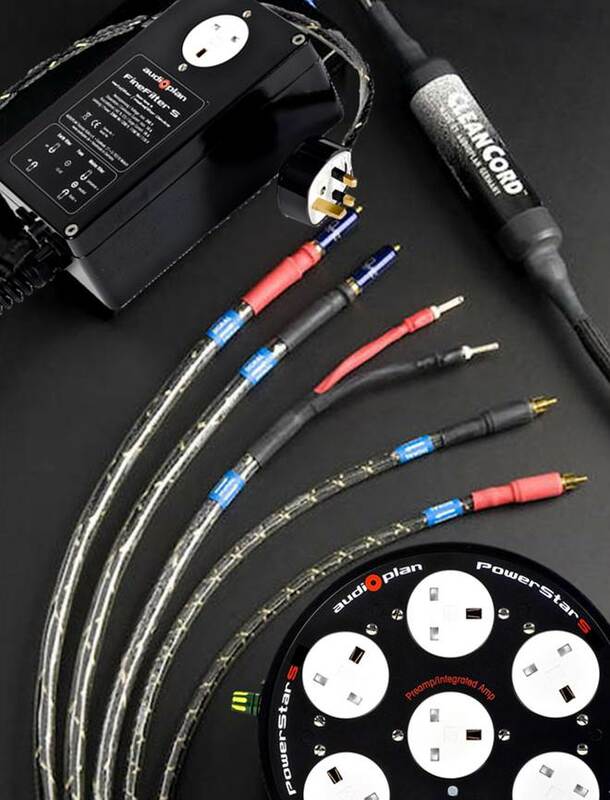 The inlet cable named “PowerCord S” has a UK 3 pin 13 amp plug fitted to the review sample and of course other terminations are available, plus the lead length can also be specified when ordering. The conductor wire is 4 x 2.6 mm2 and made from pure copper with silver plating. External appearance of this cable is rather attractive with a mult-coloured mesh sheath, finally encased in a clear outer shroud. There are two toggle switches fitted to the filter box which cater for a “Ground filter” setting for one of the switches, plus another 3 position toggle switch denoted as “Presence+”, “Neutral” and “Bass+”. Linking the FineFilter to the PowerStar is a supplied flying lead with a UK 3 pin 13 amp plug at one end and a C19 20 amp IEC connector at the other end. The FineFilter S retails for £485.00, the PowerStar S retails for £435.00 which also includes the PowerCord S. The PowerCord S is available separately at £175.00 for a standard 1.5 metre length and other lengths with commensurate prices are available. Or rather, what it doesn’t sound like, because it doesn’t have a sonic signature of it’s own. However, the first obstacle I had to overcome was where to place these two items. Being a large cylindrical construction and having a separate filter box to contend with meant I had to make some choices about location when installing this combo. They wouldn’t fit under the rack and not behind either, having them to one or the other side of the rack wasn’t an option, unless I wanted my good lady wife to offer me a large dose of ear bashing for my sins and also running the risk of damage from vigorous vacuuming from said spouse , so I sat the pair on the top shelf of my rack out of harm’s way. Now, if I was the owner of these items I would be very tempted to remove the 3 feet from under the PowerStar unit and wall mount it out of sight, then pop the smaller Finefilter unit somewhere else. Having a total of seven power outlets though was very much appreciated, because every component in my system was ably catered for. Right then, on to some listening to gauge how effective this pair is. There was no “WOW!” moment from the outset, instead everything sounded just so solid and tangible but in an understated way. Treble definition seemed to be noticeably clearer, with ambience especially giving a more detailed and resolved sonic picture. The entire audible sound palette was just THERE in full detail, unfussed and uncluttered with no shortfalls I could even begin to mention. It wasn’t that I was unenthusiastic, it was more that I was secure in the knowledge that the improvements were right across the board from the upper treble right down into the lower registers, but never once in an in your face floodlit style – very subtle in fact. Separation between instruments was noteworthy, without showing any clashing or crashing into each other during hectic music passages and sound staging too was crisp and concise. I couldn’t hear any squashing or suppressing of dynamics with the combination under review. Live albums especially had vibrancy and “aliveness” that really made you feel as though you were sat in the venue maybe four or five rows back from the stage, hearing all of the music clearly and being right in amongst your fellow audience members. My recent purchase of Fink’s “Wheels Under My Feet” live album recorded in different venues around the world exemplifies that feeling of just being there each time when the tracks were actually recorded. I took the opportunity during those tracks to experiment with the toggle switch positions on the FineFilter unit. Try as I might, I couldn’t find any perceptible differences with either one of the switches on or off in whatever position and I count myself fortunate in having good hearing acuity. That was as much attention as I paid to that pair of switches and thereafter left them in the OFF position for the Ground Filter and in the NEUTRAL position for the “Presence+” and the “Bass+” toggle switch for the remainder of the review period. You may find otherwise of course. 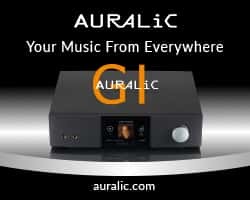 Most components that don’t provide that initial WOW factor from the start and are laced with subtleties throughout generally only make their true presence felt when they depart and the Audioplan pair did exactly that when I took them out of my system. 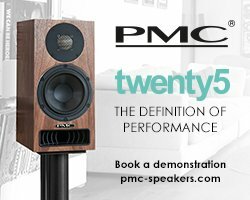 The palpable weight and strength in the bass departed with them, so did the top end detail resolution, as did the midrange power, in fact the system sounded a tad thin and anaemic afterwards and that was with my resident mains conditioner installed once more. 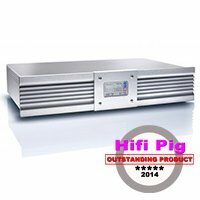 I would say that the final paragraph in this review above sums up my time with the Audioplan FineFilter and PowerStar pairing perfectly and it would be totally superfluous to add any more here. It takes living with them full time to appreciate their true worth and if there is any doubt, then I suggest disconnecting them for an hour or so to prove that point unequivocally. For that reason I give a full and deserved recommendation. Recommended for: An understated performance, delivered in an unassuming manner. Price is good value too, so should undoubtedly be on your audition wish list.